© Copyright 2011-2019, TMJ & Facial Pain Institute, All Rights Reserved. 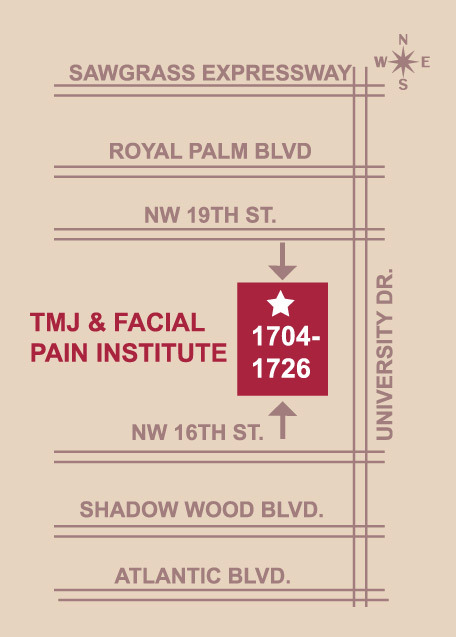 The Facial Pain Institute is your TMJ specialist in South Florida. We educate you on TMJ/TMD symptoms, jaw pain, splint therapy for TMJ, TMJ treatment, maxillofacial surgery, and temporomandibular joint dysfunction. Located near Ft Lauderdale TMJ treatment center is in Coral Springs, Broward County Florida.